Festive FREEBIE number five is in French and Spanish. It’s an example letter to use as writing frame or reading comprehension plus downloadable Xmas style writing paper for your own class letters to Santa. Letters they can then post in the school letter box or take home and put under their Xmas trees. Explain to the class that you have received this letter in the post.Show the letter briefly on the screen. Ask the class to help you investigate the text and decide what type of letter it is and help you see what information is mentioned in the letter. On a board write the phrases: “Dear Father Christmas” and also “Thank you very much” (.You can find these on the target language letter examples).Ask the children in pairs to talk about what they think these phrases might mean. Give them a clue by showing them the blank letter template on the whiteboard. Take feedback . Show the example target language letter on the large class screen and look for the two phrases the children have discussed. Highlight these on the screen .Reinforce the fact that theses two phrases are used to write lots of letters and that you just replace the name of Father Christmas with another name if you are writing to someone else. Ask the children to decide who they think has written the letter. Encourage trhem to use the picture clues on the screen . (It’s a letter from one of our alien family characters- sister alien.You can see a picture of her on the right hand side of the letter .The alien family stories run right through out our Primary Languages Network Ready Made French and Spanish KS2 SOW so your classes may already be familiar with them or you may already have met them if you have used our “Guess Who?Xmas Jumper” resource from our Primary Languages Network Active Lingo Shop) . Has the class realised that this is Santa’s wish list letter? What nouns might they expect in a wish list of presents? Brainstorm in English and in the target language. Take a look through the list of items (nouns) in the letter.Can the children indentify some of these nouns because they look simlar to English? Use bilingual dictionaries to find unfamilar language. Play a memory game with the items- who can remember four items/ five items/ items in alphabetical order etcetra? Now solve the problem - what type of letter is this? It’s a wish list letter to Santa. Ask the children in the air with invisible pens to write in the target language what they think is the best gift from the list of items and send it by magic through the air to Santa. Ask the class to write on white boards their favourite item from the list.Ask children to add extra items using familiar nouns they already know.Encourage some children to extend this by adding u nfamiliar nouns after looking them up in bilingual dictionaries. Discuss what they think the first paragraph in the letter might mean in the letter.Get the children to think about what they might want to say in Engllish in a letter to Santa.Explain that the author of the letter is telling Santa that he/she has been very good this year. 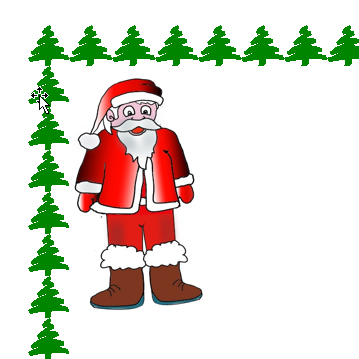 And now it’s time to have fun and write your own letters and keep our Primary Languages Network letter to Father Christmasr as a writing support on the big class screen.